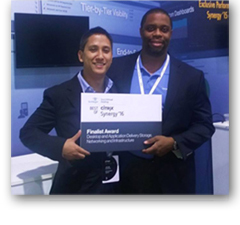 TechTarget Best of Citrix Synergy 2016 Finalist Award – eG Innovations’ eG Enterprise 6.1 was selected as one of two finalist winners in a very competitive category that drew a record number of entries this year: Desktop and Application Delivery Storage, Networking and Infrastructure. Network Products Guide Award – Network Products Guide selected eG Innovations as a Bronze Winner in the ‘New Products and Services’ category for 100-499 employees with recognition for the innovations made in its latest release, eG Enterprise 6.1. Computer Reseller News (CRN) Award – eG Innovations was selected by Computer Reseller News (CRN) as one of the top 20 Data Center Tool Providers in its annual Data Center 100 list. 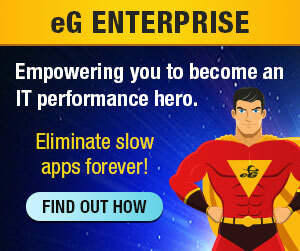 eG Enterprise 6.1 was highlighted for simplifying and accelerating application performance monitoring across mission-critical virtual, cloud and physical IT infrastructures. Read the press release: eG Innovations Selected as Finalist in TechTarget’s Best of Citrix Synergy 2016 Awards. 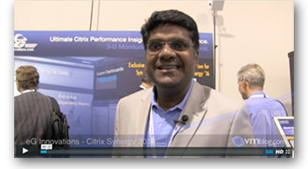 VMBlog produced an informative Citrix Synergy Expo-floor interview with eG Innovations’ CTO, Bala Vaidhinathan, who discussed eG Innovations’ solutions for Citrix IT teams. The concise product walkthrough demonstrates how eG Enterprise’s end-to-end insights and automated performance diagnosis technology help ensure top performance for Citrix end users. Watch the eG Innovations Citrix Synergy 2016 interview on VMBlog.com. The eG Innovations booth was incredibly busy throughout week, as we talked with so many partners, Citrix pros, and enterprise IT leaders. Performance monitoring for Citrix is a hot topic these days and user experience monitoring in particular surfaced many times during conversations with attendees. Kudos and thanks to the Citrix Events team for an excellent conference. We look forward to Citrix Synergy 2017.